I was on pins and needles waiting for Game 3 of the NLCS, because while Game 2’s win was amazing, it was also highly necessary with Clayton Kershaw on the mound. A victory today would really give the Dodgers an actual advantage in the series, and they managed to get just that, going up 2-1 in the NLCS with a 6-0 shutout victory of the Cubs. Despite my constant worrying, the game would’ve been quite stress-free if it were just a normal contest, but nothing really is at this point. Rich Hill actually struggled a bit early, and in the second inning he issued two walks, gave up a stolen base, and had a passed ball advance runners thanks to a mix up in signs with catcher Yasmani Grandal. Thankfully, no runs crossed the plate, and that was a key in Hill’s otherwise stellar outing. …Hill twirled six shutout innings on 93 pitches, surrendering just two singles to Kris Bryant and two walks while striking out six and turning in exactly the kind of performance the Dodgers paid for when they traded for Hill back in July. But it also didn’t hurt that the Dodgers got to Cubs starter Jake Arrieta. Arrieta struggled in the second half of the year as he lost his cutter, but he said recently he got it back. While I was skeptical that he really did, I became concerned when it did indeed seem like he was throwing it and getting it in on the hands of lefties. That only makes what the Dodgers lineup did all the more impressive. In the third, Andrew Toles singled to start the inning and he advanced to second when he and Hill tried to execute a slash-and-run but Hill grounded out to third. Toles eventually scored after Corey Seager singled on a line drive to right field, putting the Dodgers up 1-0. In the fourth, Josh Reddick reached on a one-out infield single then stole second base and eventually stole third with two down. His presence on third, combined with Arrieta’s tendencies to throw wild pitches, seemed to cause him to go away from the curve in the dirt to Grandal (which would be the right pitch choice), and instead he left a fastball over the plate that Grandal smashed for a 3-0 lead. Then, to lead off the sixth, Justin Turner took a first pitch Arrieta curve and put it into the center-field seats for a 4-0 lead. That knocked Arrieta out of the game, but the Dodgers touched up the Cubs bullpen a bit as well. With one down, Yasiel Puig singled to left, which was followed by a Joc Pederson opposite-field double to drive him in and make it 5-0. 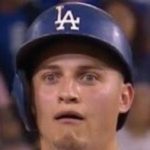 Joc proceeded to steal third, which is sorta comical considering the lack of running the team did during the regular season. That led to another run after Grandal grounded out to short for a 6-0 lead. The non-Kenley Jansen Dodgers bullpen got back to work today as well, with Joe Blanton pitching a 1-2-3 seventh inning, bouncing back from the Game 1 disaster. Grant Dayton also bounced back, getting the first two outs of the eighth before giving up a double down the line. With a four-run lead, Dave Roberts decided to not take any chances and went with Kenley Jansen. Unsurprisingly, Kenley ended the inning with a strikeout. And the only controversy of this game was Roberts’ decision to leave Kenley in for the ninth even after the Dodgers extended the lead to 6-0. Look, it’s not a huge deal or anything, but the Dodgers depend on him a lot, and using him when they’re up by six runs is less than ideal when they have two straight games coming up in which they’ll be underdogs. Honestly, if the rest of the pen can't get three outs before giving up six runs, the Dodgers deserve to lose anyway. Take Kenley out. It’s something to remember going forward. Jansen, of course, got the ninth without much trouble, his biggest danger coming after he made Anthony Rizzo‘s bat explode and he reached on a single after everybody tried to avoid getting killed by the shards. Yo, the FS1 producers were having a bad day. New players “Travis Woods” and “Alex Gonzalez”. Oh and Russell Westbrook was checking in on the Dodgers. Fan just asked Russell Westbrook who he was rooting for in #NLCS. Westbrook looked at him like he was crazy, threw up his hand: "Dodgers." Tomorrow, the Dodgers and Cubs play Game 4 at the same place and same time with the mound matchup being Julio Urias against John Lackey. God I hope Urias shoves just for the glory of it all.